and to thank God for his faithful servants. I don’t know how to write the next words…. 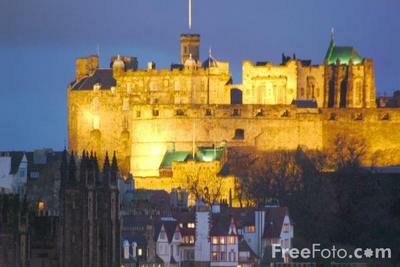 My husband and I are going to Scotland next spring. I can only blame the books. a kinship with a people. So I’m starting the journey of planning. this can be as fun as the trip itself. Of course, I’m planning where to go. But right now I’m planning what to read before we leave. John Buchan and O. Douglas. This entry was posted in Uncategorized and tagged Scotland by alivingpencil. Bookmark the permalink. i get to go spend time with my daughter in England SOON as she’s having baby number 3 at the beginning of November. There’s just such a different feeling to a place with so many years of history–and the stone and brick of the buildings. YOU’RE GONNA LOVE IT! I am so thrilled for you, Carol! And there is no one I can think of who will enjoy it as much as you. I know that your research will be every bit as much as enjoyable as the trip itself. I look forward to hearing every bit of it – the research, the planning and the trip itself. Hooray! I am SO happy for you two!! I don’t have any reading suggestions, but if you have Netflix, I highly recommend Monarch of the Glen. Wonderful, wonderful series. I fell in love with Diana Gabaldon’s Outlander series. They are not what one would call literature, but they are addictive. The series is kind of a time travel thing, which I am definately not into, but it gives her characters some unique perspectives. The books are not science fictiony at all. The first book, maybe called Outlander, takes place mostly in Scotland, in the early 1700s. The author uses lots of the native tongue, and I tried a couple of words on a real live Scot, and he knew what I was talking about. In the later books, the characters end up moving to the new world. I love to travel, so enjoy yourself for me. Oh, Carol! I LOVE Scotland and have been trying to get back FOREVER. If it calls you, you will definitely love it too. I love all things Scottish too. Lets see… definitely read The Bruce Trilogy by Nigel Tranter. Also, watch several episodes of Hamish MacBeth – they’re a hoot and will give you some lovely scenery of the Highlands, the Peat Hills (watch out for those), and Lochs. Another one that isn’t exactly Scotish but still very sweet and travel’s through Scotland is Oliver’s Travels on DVD. Besides, its such a delightful movie anyway.You should definitely go to the Isle of Skye… very beautiful with some nice hikes there. We tried to get to some of the coastal towns but were stopped by treacherous roads and thick fog. 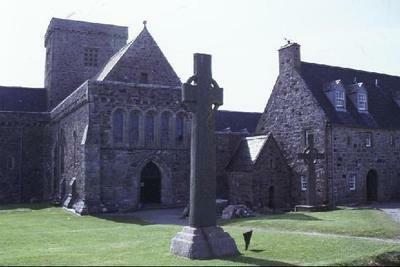 I would love to make a Pilgrimage to Iona… someday. Ben Nevis is a nice area too. Well… I should stop now. I’m getting very green. Enjoy planning your trip. Oooh! Wow! What an incredible gift. 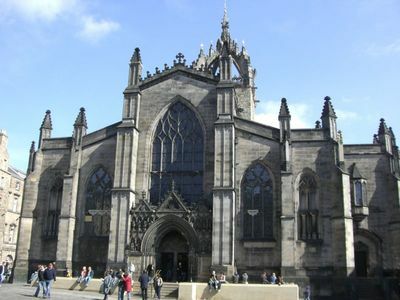 Our family has lots of Scottish heritage–I would love to visit there someday. I’m sure you’ll enjoy yourself immensely. P.S. I love Scottish Chiefs. Carol, how utterly wonderful! May you both enjoy every second of the planning and of the trip itself. I will look forward to your posts about it. Well, I’m just jealous .You should read the 4-volume Tales of a Scottish Grandfather by Sir Walter Scott, edited by George Grant. Listen to some Celtic Woman music for atmosphere (you can also get videos of their concerts at Netflix). How lovely! My oldest went to Aerdrie one year, to help with a little church there. The pastor took the helpers all over and gave them great lectures on Covenanter history…it actually changed his personality some! I guess he would say that Scotland makes a lasting impression on you. The trip will be wonderful, but I think that the preperation is going to be just as nice! Scots wha’ ha’e, Scots wha’ ha’eHear the voice of Scotland, Scots wha’ ha’eScots wha’ ha’e, Scots wha’ ha’eScreamin’ from the Highlands, Scots wha’ ha’eScots wha’ ha’e with Wallace bledScots wham Bruce af aften ledWelcome to yer gory bed or to a victoryNow’s the day, now’s the hourSee the front of battle lourSee approach Edwards powerChains and slaveryWhat can be a traitor knaveWhat can fill a coward’s graveWhat say base to be a slaveLet them turn and fleeScots wha’ ha’e, Scots wha’ ha’eHear the voice of Scotland, Scots wha’ ha’eScots wha’ ha’e, Scots wha’ ha’eScreamin’ from the Highlands, Scots wha’ ha’eIn a kilt with a Claymor at my sideDon’t ye make me take it out of it’s sheathI’ll stick it in yaIn a kilt with a Claymor at my sideClenched gauntlet ’round a black bottle neck gittin’ it in yaSo git it doon yaWha’ ha’e!Lay the proud usurpers lowTyrants fall in every foeLiberty’s in every blowLet us do or dieWha’ for Scotland’s king and lawFreedom’s sword will stronly drawFree ones fight free ones fallBut they will be freeScots wha’ ha’e, Scots wha’ ha’eHear the voice of Scotland, Scots wha’ ha’eScots wha’ ha’e, Scots wha’ ha’eScreamin’ from the Highlands, Scots wha’ ha’eScots wha’ ha’eScots! Wha’ ha’e!Scots wha’ ha’eScots! Wha’ ha’e! Oh my goodness! It is Scotland that is not so full of light, not my Elizabeth! Thanks, Alfonso. I’ll check it out.